Sriram (Chennai, India) on 4 October 2007 in People & Portrait and Portfolio. At the villages of the Yelagiri Dist. wow, very nice portrait. the color of the shirt against the color of the BG is outstanding. I love his expression.. a mixture of innocence and bewilderment... very well captured!! cute boy with big eyes! Thats one of the best photo portraits that I've ever seen! He looks like he just finished eating a treat & you caught him & now he feels he may get in trouble. Beautifully composed shot. I love all the colour. 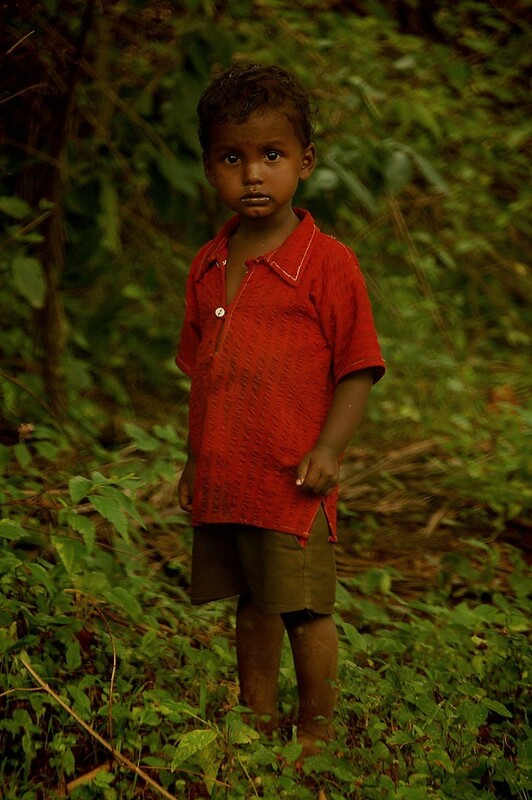 Oh my God, this boy is alone in the middle of jungle, looks to be abandoned. The human in nature. Very emotional shot. ehe ... this is so beautiful shot .. i cant state one prominent thing here .. this is just perfect re ! One could also say: amazed, I see little amusement in his face, what I see is children's observing: "who are you and what are you going to do, do you have something pleasant for me or will I have to resist?" - wonderful portrait! Amazing and amazed gaze. Fascinating tones. Beautifu portrait! Love those eyes!